Serious Vintage Episode 12 highlights a special event in the Vintage Magic the Gathering realm: the TwaunSerious Invitational. Unfortunately Twaun himself (@Twaun007 on Twitter) couldn’t join us because his apartment is from the 1850s and doesn’t include Internet (does include diphtheria! ), but we did get de facto second-in-command Jerry Yang (@yangtrolls) to help us talk about the event and the mighty rivers of scotch that flowed there. Also, Geoff (@ThallidTosser) got interviews with each player of the TwaunSerious event, so enjoy listening to those. Yes, the TwaunSerious Invitational (TSI) was a ton of fun for everyone involved. 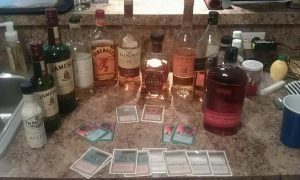 We ate, we drank, we joked around, and we played several fun hours of the queen of MtG formats, Vintage. Twaun gave out more than he took in on prizes, thanks mostly to his generosity. (He did purchase much of the prize support years ago at a lower cost, but that doesn’t make it worth any less now.) There are plans in the works now for TSI:II, and we’re already looking forward to making the second installment even more serious. It’s important to have events like these, where it’s possible and when the time is right. Especially with the loss or movement of the Vintage Championships from GenCon this year (which we knew about when we recorded but deliberately avoided as the dust settles), Vintage needs marquee events. Playing at the TSI brought several players out of retirement, as well as enfranchising some new ones in the Vintage community. It’s important to build this sense of community, since that’s what keeps many people in the format. After all, there are better prizes and more players elsewhere, so what else does Vintage have? 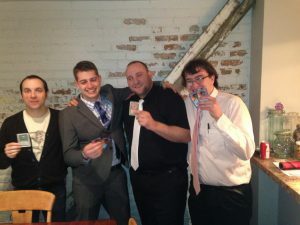 We touched on some strategies for hosting similar events and for making Vintage an experience, more than just a Magic tournament, moving beyond the $20-entry-for-cash-prize events that are common. The TSI was created by Twaun, but there was a lot of encouragement and support from the rest of Team Serious as well. In the future, we would look to spread some of the burden around, pooling money for prizes, food, and beverages and so forth. Also in the future, I think we can look forward to hosting more players. 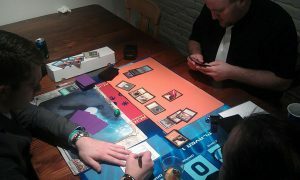 This first event was capped at 24, which would have made Twaun’s apartment cramped, but that doesn’t mean we won’t expand. Other events are starting to pop up (especially in light of the Vintage Champs situation) that could have a similar feel, and we look forward to encouraging, watching, and playing in those. If you aren’t aware of Nick Detwiler’s NYSE Open Power 8 tournament, for example, definitely check that out. After the tournament, everyone adjourned to Bar Cento in Ohio City for dinner. The original plan was to visit Market Garden Brewery, but it was packed—a good sign for the quality of the restaurant, but not for getting 13 hungry gamers seated in a timely fashion. Bar Cento served the pizzas and the drinks for the rest of the evening. The duck prosciutto and sunny-side-up pizza were especially well received. As for drinks during the event, the Glenlivet 15 and the Ransom Old Tom Gin were very well received. Cardhu, Glenmorangie, and Johnnie Walker also provided courage for many a Vintage player. Geoff recorded interviews with each player during the event when he was able to catch them between rounds. As such, the interviews provide individual slices of the TwaunSerious Invitational as it was experienced. Some of the audio isn’t great, since recordings were made in the echoing stairwell, but everything should be listenable. They are ordered by finish, from last to first. So that’s it for this week. Follow up with us on Twitter or at seriousvintagepodcast@gmail.com if you need more food and drink recommendations, or to let us know that our taste in whisky is terrible or to laugh at us for doing poorly at a serious Vintage event. We’ll look forward to hearing from you. Thanks! The top four: Jimmy McCarthy, a very drunk Sam Krohlow, Mike Solymossy, and Charles Rolko. The mood lighting in Twaun’s underground bunker makes Vintage look super classy. 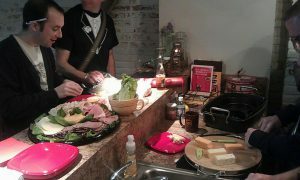 Twaun provided his guests with this delicious spread of meats and cheeses after round three. Players brought beverages to share, and Twaun graciously provided prize support.